Investigations based on a complex of techniques revealed that the modern deposits in the Northern Caspian Sea involve terrigenous sands and aleurites with an admixture of detritus and intact bivalve shells, including coquina. Generally, these deposits overlay dark grayish viscous clays. A similar geological situation occurs in the Volga delta; however, the local deposits are much poorer in biogenic constituents. Illite prevails among the clay minerals. The heavy transparent minerals are represented in the coarse aleurite fraction mostly by epidotes, while quartz and feldspars represent the lighter minerals. The sedimentary material in the Volga delta is far from completely differentiated into fractions due to the abundance of terrigenous inflows, which exceed the energy potential of the river. The comparatively better grading of the sediments at the testing sites is due to additional factors such as the bottom currents and storms. When passing from the Volga delta to the testing sites, the sediments are enriched in rare earth elements (except Eu), Ca, Au, Ni, Se, Ag, As, and Sr but depleted in Na, Rb, Cs, K, Ba, Fe, Cr, Co, Sc, Br, Zr, Ta, U, and Th. The concentrations of Zn remain almost unchanged. The sedimentation rates and the types of recent deposits in the Northern Caspian Sea are governed mainly by the abundant Volga discharge. Original Russian Text © V.N. Sval’nov, T.N. Alekseeva, A.O. 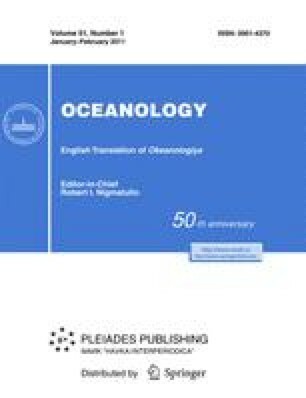 Gazenko, 2011, published in Okeanologiya, 2011, Vol. 51, No. 1, pp. 123–135.